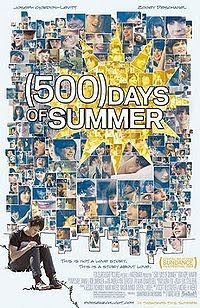 500 Days of Summer's tag line: It is not a love story. It's a story about love. And it's true. It stars 3rd Rock from the Sun's Joseph Gordon-Levitt and Zooey Deschanel. Mr. Gordon-Levitt has grown up to be a fine young actor (who for some reason frequently reminded me of Heath Ledger). He is Tom Hansen, a believer in true love; Zooey is Summer Finn, who isn't. The events unfold in a non-linear fashion. We see bits and pieces of the relationship at different phases of the titular 500 days. It's a great story-telling device, because you get to look back and see different perspectives. It's viewing things through rose-colored lenses, and seeing them objectively without the lenses. I loved Chloe Moretz, the little girl who played Tom's sister, Rachel. She was the truth teller, the voice of reason for her confused brother, and had some of the film's funniest lines. For example: Just because she's likes the same bizzaro crap you do doesn't mean she's your soul mate. Or: Just some guy she met at the gym with Brad Pitt's face and Jesus' abs. The film is a romantic comedy, but I could see it as a musical. I loved the music. I might get the soundtrack. There was even a dance sequence ala-Enchanted in a park. Which for a music video director like Marc Webb, must have been peanuts. I liked the ending for our Tom and Summer. Kudos to the writers. Anything else would have been a cop-out. Oooooh! I want to watch this movie!